Nurses were Ireland’s biggest export in the late 1980s when Anne Kelly finished her five years of training, first as a nurse and then as a midwife. “The job situation at home was bad and everyone was going somewhere else,” she recalls. Anne herself was recruited to come to New York City in 1987 from Kilconnell, Co. Galway, to work at Memorial Sloan-Kettering Cancer Center but it wasn’t her first time working outside Ireland. Earlier, Anne had the opportunity to spend 10 months as a midwife in Saudi Arabia, Anne credits her successes to her nursing studies at University Hospital, Galway, where the nuns were in charge. “Wherever we go, our training has stood to us,” she notes. “It’s in us to do the best we can for every patient. I think Irish nurses get on very well everywhere. Maryellen O’Sullivan, whose grandparents came from Tipperary and Kerry, received her Bachelor’s degree in nursing from Wagner College and an advanced practice degree from NYU. 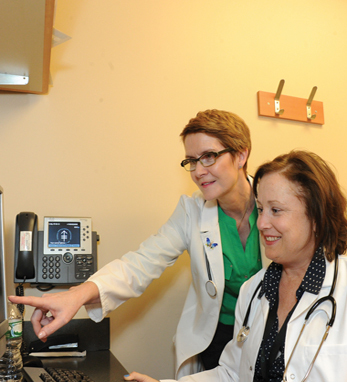 As a nurse leader at Memorial Sloan-Kettering Cancer Center’s Sidney Kimmel Center for Prostate and Urologic Cancers, Maryellen has about five nurses on her staff who were trained in Ireland and also works with many nurses of Irish descent. Technology has become much more of a presence in nursing today, Maryellen says, but the “key thing is meaningful use of technology and while it can be a learning curve for some people, it doesn’t take away from their ability to do a nursing assessment or to develop an individual plan of care.” No matter what the specialty or sub-specialty, Irish nurses have demonstrated their abilities to bridge the old and new worlds with grace, good humor and ability.